Cocos Islands (Keeling Islands), a territory of Australia consisting of two atolls and twenty seven coral islands located midway between Sri Lanka and Australia in the Indian Ocean has a total land area of 5.3 square miles and a population of around 600. Tourism is the major industry followed in a distance by offshore banking, pearls and fruit export. The only cash crop of the place is coconut. Necessities are imported from Australia. The climate is pleasant for the most part of the year with cyclones probable in the early months of the year. The best time to dive Cocos Island to view the hammerheads is June through August. 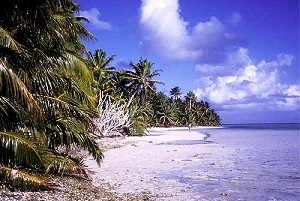 In the vicinity of the Cocos Island lies some of the best diving sites. Nutrient-rich water around the island attracts hammerhead sharks, manta rays, eels, dolphins and the like. A kaleidoscope of colors can be observed while snorkeling. Whether seeking historical and cultural knowledge or the adrenaline rush of diving in shark waters Cocos has it all. Cuisine is very similar to Malay with rice, noodle, curries and chili. Diving and Snorkeling Guide to Cocos Island 978-1559920926 $20 Lonely planet book on diving and snorkeling the Great Barrier Reef. A description of around 14 different sites around Cocos Islands and a section on Reef Etiquette and Safe Diving. Coral and Atolls: A History and Description of the Keeling-Cocos Islands by Frederuc Wood Jones (University of Michigan library) B0041T3ZNU $33 A history and description of the Keeling-Cocos Islands with an account of their fauna & flora, and discussion of the method of development and transformation of coral structures in general. The Treasure of Cocos Island; A story of the Indian Ocean by James Otis 978-0217612920 $24 OCR Edition without illustration or index, but you get the rights to get a free scanned copy of the original rare book from GeneralBooksClub.com first published in 1902. A copy of the book can be downloaded FREE from archive.org, thanks to Google digitizing of ‘NOT_IN_COPYRIGHT’ book. The first stamps of Cocos Islands were a set of six stamps released on June 11, 1963. The set (Scott #1 to #6) catalogs for around $40 MNH and $14 for used. The designs show copra industry, Super Constellation, map of Islands, Coco palms, sailboat (dukong), and fairy tern. Super Constellation design made into the first stamp issues as the introduction of the Super Constellation service by Qantas using the Wallaby Route (Sydney via Perth, the Cocos Islands, Mauritius, Johannesburg) in 1955 was a significant event that alleviated the Islands relative isolation. A set of five stamps released on November 24, 1980 to mark the twenty-fifth anniversary of Australian Territory status. The set (Scott #56 to #60) catalogs for around $2 MNH or used. The designs shows flag and arms of past Cocos Islands territory administrators – Ceylon 1878 and 1942-46, Straits Settlements 1886, Singapore 1946, and Australia 1955. A sister set of two stamps were released on November 30, 1984 in the ‘Integration with Australia’ theme. The sheet of two (Scott #125a-b) catalogs for around $3 MNH or used. The designs show Australians welcoming Cocos Islanders and Australian flag over the islands. A set of three stamps and a souvenir sheet released on April 20, 1984 to mark the seventy-fifth anniversary of Barrel Mail. The set (Scott #112 to #114) and the souvenir sheet together catalog for around $10 MNH or used. The designs show mail distribution, Direction Island, Jukongs retrieving barrels from Ocean Liner, Morea receiving outgoing barrel mail, and barrel mail recovery. A part of the mail to Cocos Islands was delivered using this method during the period from 1909 to 1955. The practice started when the P&O liner RMS Morea altered course to pass close to Direction Island and drop off meat, vegetables, books, and mail. A set of three stamps released on October 13, 1992 to mark the fiftieth anniversary of World War II events on the island. The set (Scott #264 to #266) catalogs for around $5 MNH or used. The designs show Royal Air Force Spitfire fighters, Japanese bombing of Kampong, and Sunderland reconnaissance flying boat. The island was the site of Cocos Islands mutiny on May 8-9 of 1942 when fifteen members of the Ceylon Defence Force mutinied and attempted to take control of the gun battery on the islands. The mutiny was crushed and three of the men involved were executed and those were to be the only ones among the British Commonwealth soldiers executed for mutiny during World War II. A set of four stamps released on March 30, 1993 showing Island currency tokens. The set (Scott #274 to #277) catalogs for around $7 MNH or used. The designs show different tokens used on the island in place of actual currency. The island has an interesting history of using tokens made of unusual materials. From 1913, seven ivory coin denominations in different shapes and sizes were used. The coins were replaced with colored plastic rupees and cents made of an ICI product in 1969. This odd setup was to prevent the islanders from buying illegal goods from passing ships. A sheet of twenty stamps released on June 17, 1999 in the Flora and Fauna theme. The set (Scott #331a-t) catalogs for around $12 MNH or used. The islands have released a number of sets covering flora and fauna over the years, but this set is notable because of its coverage of the whole spectrum. Cocos Islands issued Plastic Ivory Tokens in 1913 and Modern Plastic Tokens in 1970. More recently in 2004, they issued a 7-coin proof set with a mintage of 5000. The tokens and coins are sought after, mostly by collectors of ‘one-coin-per-country’ theme. Certain rare UNC notes from the turn of the century are also in the market for upwards of $100. Memories of an exciting time are what travelers try to capture from the island. Local art, watercolors and paintings are well sought-after here.